First of all I want to thank the Lord for showering me with lots of blessings including great friends. Can you imagine yourself living alone... without a friend.. tsk.. tsk.. it must be so hard if you don't have anyone that you can call a friend. Why I am saying this is because even if there are people who are trying to put you down, there are still people who are true and sincere with their friendship to you and I thank God for that. Now I want to thank my very good friend and sissy dhemz for being such a sweet and thoughtful sister in the blogland. She sent me this wonderful stuff for my birthday.. Thanks a lot Manang.. 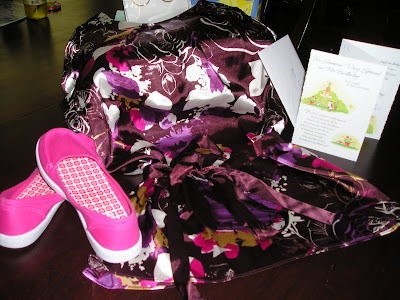 I love everything.. the shoes was a perfect size for me ( see the wonder of a true friendship, even if we haven't see each other yet, she guessed my size wohooooo).. the earrings, my favorite!... I like the blouse too, mwah! And my most favorite part?.. is the message you wrote for me.. luvya so much sis! Right now sis I already chewed all the candies lol. 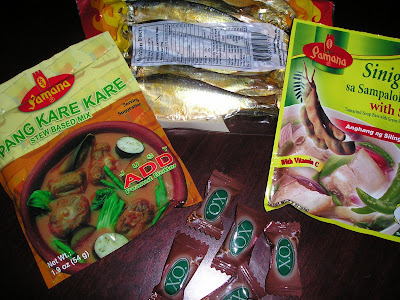 and i can't wait till i can fry my tuyo, gosh i miss this very much... how do you know I am craving for dried fish hehehe.. And I guess I have to learn how to make kare kare now that you gave me a mix lol..
Have a good day everyone! May God shower you lots of blessings today too!